Does WHO recommend a specific caesarean section rate at country level? No, through this Statement WHO does not recommend a specific rate for countries to achieve at population level. The work conducted by WHO found that as countries increase their caesarean section rates up to 10%, maternal and neonatal mortality decrease. However, caesarean section rates higher than 10% are not associated with reductions in maternal and newborn mortality rates. Despite this, mortality is not the only outcome to consider. Other important outcomes would be short- and long-term maternal and perinatal morbidity, for example, obstetric fistula, birth asphyxia, or psychosocial implications regarding the maternal¬–¬infant relationship, women’s psychological health, women’s ability to successfully initiate breastfeeding and paediatric outcomes. 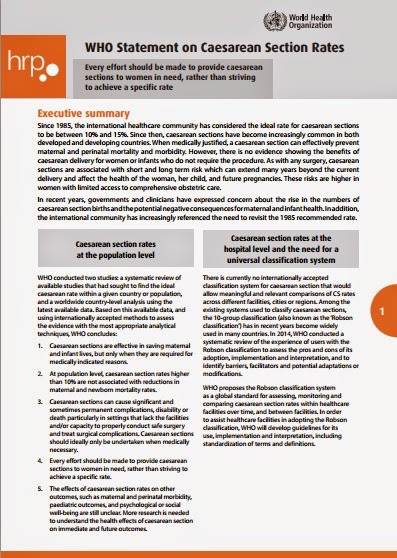 Lack of data prevented the inclusion of these and other outcomes in the WHO analysis. While there is no target for cesarean rates at the population level, research suggests that national rates of up to approximately 19 per 100 live births are associated with lower maternal or neonatal mortality among WHO member states.